Stewart graduated in Veterinary Medicine from the University of Edinburgh in 1992. Stewart graduated in Veterinary Medicine from the University of Edinburgh in 1992 and completed an Internship in Small Animal Medicine and Surgery at the University of Guelph Ontario Veterinary College, Canada the following year. 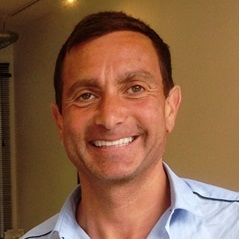 After working for some time in referral and emergency veterinary clinics in London, Stewart started his own practice that grew into the Petcare Group in West London. After the sale of the Petcare Group in 2017, Stewart now concentrates on running the Bruton Veterinary Surgery in Somerset. Stewart is a previous director of the London Veterinary Forum, which represents and advises some 250 veterinary surgeries in many aspects of Practice. Stewart has a further qualification in arbitration that allows him to carry out expert witness work. He is also veterinary advisor to Braidlock, an innovative healthcare company. Stewart regularly attends continuing professional education courses, both in the UK and abroad, to keep completely up to date with developments in veterinary medicine. Stewart is a Veterinary author and regularly appears on BBC radio as a authority on Veterinary topics. Charlotte qualified as a veterinary surgeon from the University of Edinburgh in 2002 and then also completed an internship in small animal medicine and surgery at the University of Edinburgh. At home Charlotte lives with her husband, Daughter and Son, as well as numerous pets including 3 horses, 2 dogs, 1 cat and many chickens and ducks. 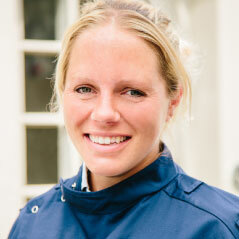 Rosy graduated from the Royal Veterinary College, London in 2012 and joined Bruton Vets in 2017. Rosy worked as a mixed practice vet in Devon near where she grew up on her family’s farm. She also spent three months in India neutering and vaccinating hundreds of street dogs. She moved to the Somerset area in 2015 and specialised in small animal practice. 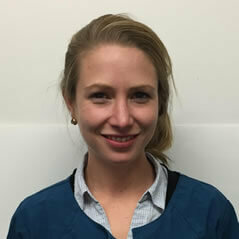 Rosy joined Bruton Vets in 2017, she has a particular interest in small animal medicine, and ultrasound scanning. In her spare time Rosy enjoys riding her horse Jack and taking part in many outdoor activities including long walks with her dog Tarka, surfing, skiing and baking. I have always had a passion for emergency care, and combined with my love of animals, Veterinary Nursing seemed the obvious choice! I qualified as a Veterinary Nurse in 1988 and worked at a practice in Wiltshire until 1996 when I took time out to start a family. Three children later, I decided to return to nursing in 2006. I joined the Bruton team in 2011 as maternity cover which led to a permanent position as Head Nurse and recently the position as Practice Manager. Now the children are older, I have a variety of pets including horses, dogs, cats and chickens to keep me busy! Amy has been here at the practice since September 2009. 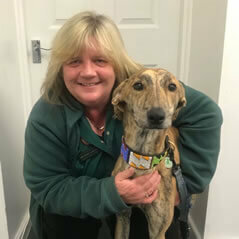 She qualified as an Animal Nursing Assistant (ANA) with distinction in 2010 and then went on to complete her veterinary nurse training here in practice. She then qualified as a Veterinary Nurse in October 2013. 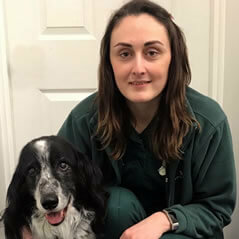 Since qualifying, Amy has become a clinical coach to our recently qualified Veterinary Nurse Sophie, a Petplan Insurance Advisor and is currently completing a course in canine and feline nutrition. Amy lives at home with her partner and senile old dog ‘Bin’ who some of you may have seen around the practice. Amy first wanted to become a Veterinary Nurse at a very young age after watching the TV program Animal Hospital and then wanting to help save the lives of animals. 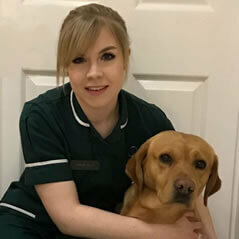 Sophie qualified as an RCVS Veterinary Nurse from the Lynwood School of Veterinary Nursing in Jan 2018. Sophie Hull was a Student at Lynwood School of Veterinary Nursing, and has now been awarded her qualification as an RCVS Veterinary Nurse. I grew up with a variety of family pets and wanted to become a Veterinary Nurse, because I have always had a keen interest in animals and their welfare. Following GCSEs, work experience within a veterinary practice and A levels, I went on to agricultural college gaining a Distinction * Diploma in Animal Management, before studying for the RCVS nursing exams and qualifying as a Veterinary Nurse in January 2018. I love the variety of jobs within a working day and have particular interests in surgical nursing and nursing clinics. I love looking after the patients, and it is a particularly good day when there are opportunities for puppy or kitten cuddles!